We would like to recommend you to go to the SSF – Vinnova third joint conference on Software for Competitiveness: Big Data and Other Frontiers held on November 14th in Stockholm. This is also a great opportunity to meet and hear all about SSF and Vinnova projects within the area. For more information and registration see the conference website. Welcome to our 3rd annual Big Data Conference at Linnaeus University. The conference this year’s host for the conference is Linnaeus University Centre for Data Intensive Sciences and Applications (DISA). We have invited researchers from our own Centre to present some of the work that has taken place within DISA this past year and Keynote and invited talks from other universities and partners. During the day longer talks with an academic focus will be mixed with poster mingles during meals. We invite everyone that has an interest in Big Data and data intensive applications so please spread the invitation and information about the conference in your networks. Students are welcome to attend too. The presentations during the conference will be held in English. The conference is free of charge, but if you register and don’t show up you will be charged a fee that covers food etc. You can now register for the conference by clicking on the registration link below. Register here. 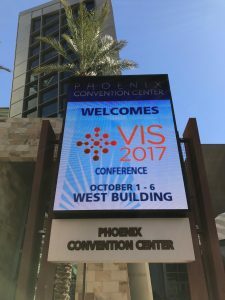 During October 1-6, 2017 Andreas Kerren, professor and Rafael Martins, Post-doc in Computer Science at Linnaeus University attended the IEEE VIS Conference in Phoenix, Arizona. IEEE VIS is the absolute top-level conference in the area of Visualization and this year they had, state-of-the-art presentations from the biggest names in the field. The conference had a very strong focus on the combination of Machine Learning (ML) and Visualization, both from the perspective of interactive steering of ML techniques and also explaining the inner workings of complex techniques such as Deep Learning. There was also a lot of discussion about Visualization literacy, meaning, how people understand Visualization and how to improve on this. Overall the conference was productive and full of interesting and diverse work and we are looking forward to see how the new insights can become valuable in from a DISA-perspective. In order to be well prepared for the last chances for H2020-funding its good to get a hold of the official documents and prepublications as soon as possible. Official publication of work programmes for the last period of H2020 is getting closer and prepublications are staring to be published. The final documents will be available from October 27 from the Participant Portal, find calls here. The prepublication of the main ICT part of the programme is now available. Remember that minor changes can still be done.